Providing incomparable products and services for the shooting industry. Chase Curtis has been shooting long range since he was 12 years old. 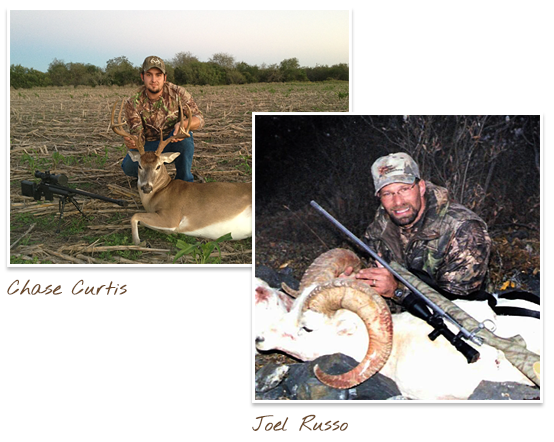 He has a background in design and manufacturing and a strong passion for precision shooting and hunting. Chase is also a USCG Master Captain. Joel Russo has extensive LE and Military experience. He has hunted big game animals around the country, and has competed in numerous sanctioned rifle matches. He has been building custom rifle stocks for tactical and situational rifles for over 10 years. www.russoriflestocks.com. Joel assisted BAE Systems and BANC 3 with the development of the PAWS system. As a network connected weapon sight, PAWS is capable of pushing and pulling information to and from the electronic battlefield. Chase Curtis and Joel Russo met in 2010. The two minds came together instantly as they share a passion for quality and precision, along with all things at the top of their respective fields whether classic, cutting edge or something in between. In 2011, after many months of discussion, a plan was made and the brand and business, Curtis Custom, was formed. From inception to present day, they have utilized their resources to provide incomparable products and services to the shooting industry.